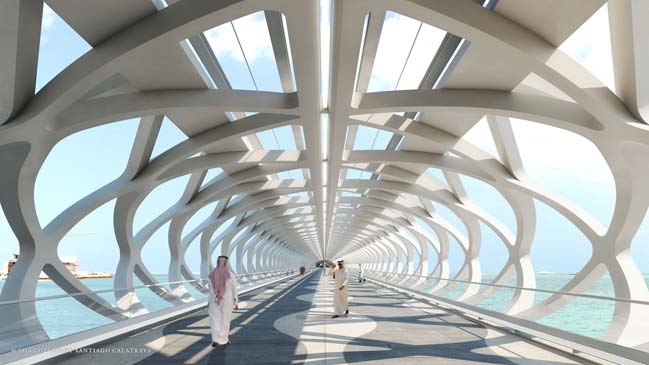 The Sharq Crossing was developed by Santiago Calatrava to create a wonderful bridge designs that helps connect three locations: the Airport area, the West Bay Financial District and Cultural City. The design concept is a unique combination of an efficient civil engineering solution and a highly iconic design. 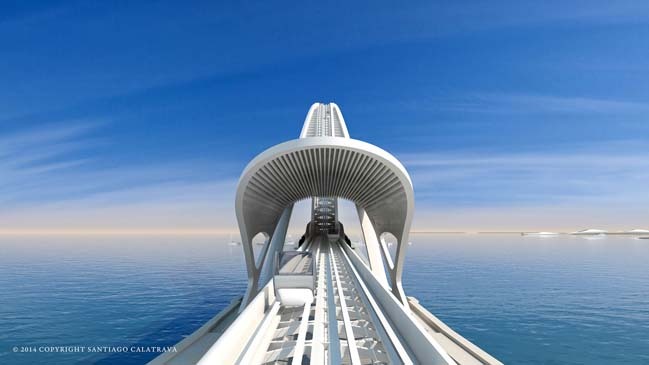 From the architects: Substituting the formerly proposed tunnel only system, Santiago Calatrava has designed a solution with a bridge at each of the three ends of the tunnel system. The connection of the bridges to the previously proposed traffic system follows the same principle at all three locations — a short tunnel underpass runs below the coastal district allowing the bridges to emerge offshore before descending beneath the sea to connect back to the main road tunnel. In this way, each bridge reads as an individual sculptural piece with distinct character drawing on the constraints of the adjacent urban environment. The conceptual design for the bay crossing is is steered by the following set of ideals: the Corniche's development as 'the Corniche Park'; an island 'Crossing' as recreational facility, bridge 'destination' and 'sub-surface road interchange'; the West Bay Bridge as a green extension of the 'Corniche Park' creating bridges of international distinction; minimising the impact on the bay environment by designing bridges with a minimum number of supports; deriving a safe and sensible solution to the problems of crossing such an expanse of water with significant submerged tunnel portions. 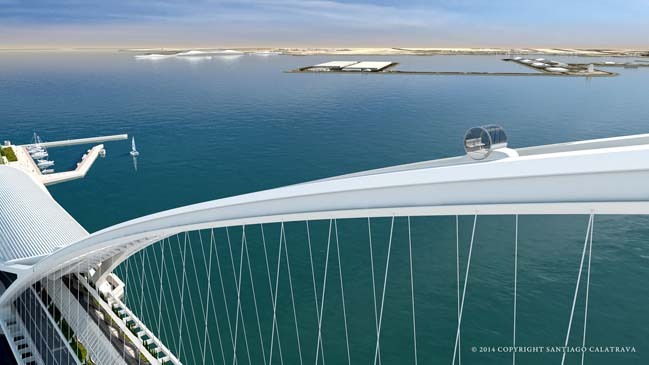 The bridge designs are obviously a visual spectacle on a grand scale, but these are in fact secondary themes to Calatrava's vision for the bay crossing. The proposed Masterplan retains an uninterrupted coastal zone recognizing its importance for the unity of Doha's districts. The traffic structures do not intersect and divide parts of the city but leave the opportunity to cross the underground traffic alignment and continue along the coastal path. West Bay Bridge A magnificent arched structure incorporating a 'longitudinal park' extending from the proposed Corniche Park along the bridge's length upon an elevated walkway. Visitors to the island can either walk along the park-like glass walkway or traverse over the bridge on a Funicular cableway enjoying spectacular views from a personal viewing cabin 125m above the sea. The bridge touches land gracefully with a pedestrian bridge and a shaded canopy for railway users while road traffic is submerged below grade. Where the road climbs and descends beneath the waves an island structure is created. The eastern island is extended to form a belvedere of terraced levels and roofs supporting various recreational activities and a marina and succinctly resolving the Lusail and West Bay Interchange using a compact semi-submerged solution. Cultural City Bridge A series of cable-stayed bridges skims across the bay in a pattern of descending scales creating a long bridge dramatically reducing the lengths of the submerged tunnel links. Al Sharq Bridge A tubular structure gracefully spans the inlet adjacent to Doha's new airport. While necessarily shallow to accommodate air traffic the bridge offers a novel, sleek conceptual form providing new visitors with a stunning first view of downtown Doha's skyline. Submerged Tunnel Links Critically, the tunnel lengths have been kept manageably short significantly reducing the cross section and excavation requirements and reducing the long-term maintenance burden by requiring comparatively simple mechanical systems (notably resolving the key tunnel design issues of ventilation and smoke extraction). Main Crossing Instead of resorting to a multi-level transition below sea level or an interchange mounted on top of a manmade island, the alignment of the roads is designed such that the necessary transport interchange is constructed within the bounds of the proposed West Bay Bridge 'abutment island'. 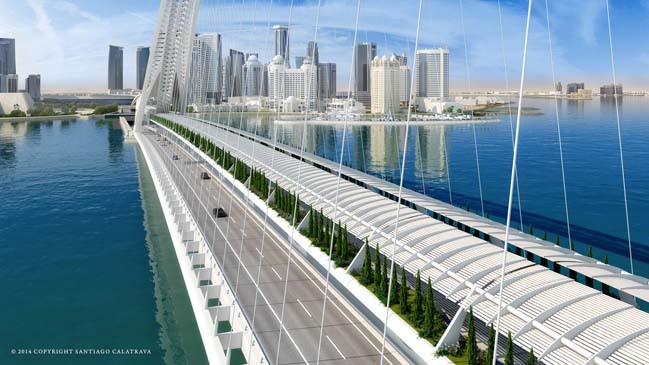 The key to the effectiveness of this solution is that the elevated level of the roadway (on the West Bay Bridge) allows it to pass over the Lusail/Cultural City tunnel and reconnect with an interchange below the sea bed (using the length of the island as a tool for vertical grade transition).